With only a few simple changes to the basic body structure, this life-size, combination torso makes it easy to teach male and female anatomy. Depending on requirements, the model can be fitted with a three-part female genital insert, complete with removable embryo, or a four-part male genital insert. It also comes with a skull, half the brain, and a removable head dissected to show the mouth cavity. The half brain and one eyeball are also removable. The body cavity includes a female breast covering with skin, muscles, and mammary glands; ribs with both lungs; two-part heart; two-part stomach; liver with gallbladder; small intestines; large intestines with pancreas, transverse colon, and cecal flap to show interior; and half of one kidney. 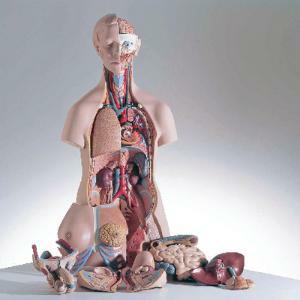 The 24-part model is mounted on a base and comes with a Torso Teaching Guide and CD-ROM with illustrations and text.